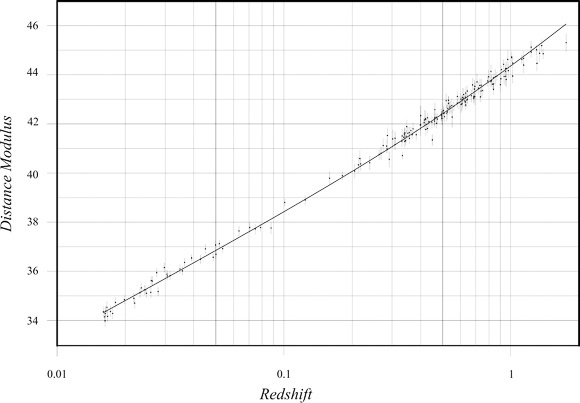 Hubble redshift fits using physics from the 1920's with no dark energy. In 1907 Einstein used special relativity to prove that vacuum permittivity is a function of gravity by assuming that acceleration and gravity are equivalent. Vacuum permittivity is the scalar in Maxwell's equations that determines the speed of light and the strength of electrical fields. Predictably, vacuum permittivity also changes with spacetime curvature in general relativity. When spacetime curvature changes, the wavelengths of both photons and atomic emissions shift. In Friedmann geometry, curvature changes in time. A photon today has a different wavelength than it did yesterday. Yesterday, an atom emitted a photon with a different wavelength than it emits today. Considered together, the evolution of atoms and photons reverse the interpretation of Hubble redshift. Hubble redshift implies that the Friedmann universe is closed and collapsing. During collapse, both atomic emissions and photons blueshift. Atomic emissions blueshift about twice as much as photons blueshift. This means that blueshifted photons seen in a telescope today are redder than blueshifted reference photons emitted by atoms today. With this insight, supernovae redshift observations are fit simply using the physics of Maxwell, Einstein, Bohr, and Friedmann from the 1920's. There is no need to postulate dark energy. Supernovae redshift data imply that the universe is very nearly flat and will collapse in about 9.6 billion years. High-z redshift observations up to 11.9 suggest that the universe is at least 2000 billion years old. This is more than a hundred times greater than a typical star's lifetime. It is probable that most dark matter is the residue of stellar evolution. The changes in atoms and photons derived here confirm Schrödinger's 1939 proof that quantum wave functions expand and contract proportionally to the radius of a closed Friedmann universe.